Target-dated retirement mutual funds are getting more and more popular, offering instant diversification into stocks and bonds, as well as automatically shift to a more conservative blend as you near your target retirement date. An all in one fund! Whenever you see a finance article talk about the “best” of these mutual funds, invariably Vanguard and T. Rowe Price top the list. Recently, Kiplinger’s Personal Finance magazine named T. Rowe Price “the best Target fund available”. I’ve been meaning to do my own personal (and imperfect) comparison for a while now. What makes a fund good? Asset class – What is the fund invested in? Large-cap domestic stocks? Short-term bonds? Expense ratio – How much is the mutual fund company charging for its services? Let’s quickly compare five of the bigger Target fund families, taking the 2045 date as a sample. Listed are the percentage of domestic stocks, international stocks, expense ratios, and year-to-date performances. It is clear all the companies agree with the first factor at least, as the asset allocations are very similar across all five funds. Note that past performance is not listed as a critical factor. 1-Year, 3-Year, and 5-Year performances for specific funds are not a reliable indicator of long-term performance. I’ve only listed them to show that they are more-or-less similar. For now, it seems Vanguard is above average in the performance area. I am taking T. Rowe Price (TRP) the edge over Fidelity because Fidelity’s Freedom Funds seem to be a hodgepodge of overlapping funds (22 separate funds, with as little as a 0.10% contribution), while TRP seems to have a slightly more clear asset allocation goal (13 funds). Also, T. Rowe Price allows lower entry requirements for investment. Okay, now let’s get to the the head-to-head comparison of their entire Target Retirement fund families. Here is a chart showing the percentage of stocks in the funds, depending on the target date. It is quite clear that the T. Rowe Price funds are more aggressive, and hold more stocks even very close to retirement. This is also the primary reason why you may hear that TRP funds have outperformed Vanguard funds. Stocks have done well recently. Much, much closer. 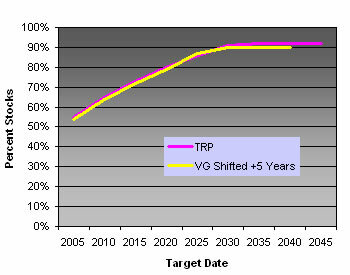 So if for example you want something that will start and adjust over time closely to the TRP 2030 fund, just go for the VG 2035 fund. Hmm… but maybe the TRP funds have more of a value or small-cap tilt, due to their use of more asset-class funds? (Small and value stocks have historically outperformed large-cap and growth stocks.) Let’s use the Morningstar X-ray tool and see. Again, we’ll just compare just the 2045 flavor to save time. Although not conclusive, it’s interesting to note that not only are (1) the style boxes are very similar, but (2) the one with more of a value tilt is Vanguard’s fund, not T. Rowe Price. Both of these funds are no-load and have no commission if you open an account directly through the respective companies. Now, since the asset allocation was pretty much a draw, you’d probably expect me to say Vanguard is the winner hands down. Not quite. Vanguard requires $3,000 to invest in any of its Target funds. In addition, it charges IRA accounts a fee of $10 a year for each fund account with a balance of less than $5,000 (waived with high overall balances). $10 a year on a $3,000 balance is another 0.33% of expenses. Still, on the 2045 funds this makes the total 0.53%, which remains lower than TRP’s 0.76%. This reflects Vanguard’s unwritten philosophy that account holders should pay for their own costs. That is, small accounts still have the costs of IRS reporting, mailing statements, etc. Remember, .20% of $3,000 is only $6 a year. Having low-balance fees keeps costs down for larger investors. As you’ll hopefully only spend a limited time being a “small” investor, this will probably work out best in the long run. T. Rowe Price, on the other hand, only requires a $1,000 initial investment for IRAs, and $2,500 for a taxable account. They also charge a low-balance fee of $10 a year for balances less than $5,000 (also waived with high overall balances). But, if you can commit to an automatic transfer of $50 a month from your checking account, you can open an account with nothing. Not even low-balance fees. This is a great proposition for beginning investors. I’m sure T. Rowe Price believes that this program will help create a loyal customer for the future. Of course, the cost of doing this also gets rolled into the higher expense ratio somehow. Although I personally don’t invest in a Target fund anymore (I used to) because I feel that the potential performance gain from specifying my own asset allocation and maximizing the tax-efficient placement of my funds is worth the additional effort, I still think these are a great invention for the average busy person who needs to think about retirement. I think I have shown these two funds to be very similar. In the end, I think for a long-term investor I would still prefer the Vanguard series due to the lower expense ratio. But if you went T. Rowe Price for the low starting requirements, you’d still be making a decent choice. Just please don’t buy an overpriced Target fund. I think American Century’s use of the LiveStrong brand is a stupid marketing gimmick. What does Lance Armstrong have to do with my retirement? I like my charity separate, thank you. Great analysis. You noted that for a given target retirement date, the TRP fund is somewhat more aggressive than the Vanguard fund. All other things being equal, more aggressive = higher long-term return. In the case of the TRP funds, I don’t think aggressiveness is rewarded. It looks like the TRP fund equity allocation averages about 10% higher than at Vanguard. Take the 2020 funds, for example, where TRP is about 85% stocks and Vanguard is about 75% stocks. According to Vanguard’s website, the historic long-term return for an 85/15 index portfolio (similar composition to TRP 2020) is 10.1%. The historic long-term return for a 75/25 index porfolio (like Vanguard 2020) is 9.9%. The difference between the two allocations historically has been 0.2%. That’s less than half the difference in expense ratios (0.76% – 0.2% = 0.56%). A fund’s return is the return of its underlying assets minus the expense ratio. One could reasonably expect the more conservative (but less expensive!) Vanguard fund to outperform the more aggressive (but costlier!) TRP fund by ~0.3% per year, with less volatility! -It seems like their equity allocation is low, but maybe you can do something similar to what you discussed and just increase the year. -Apparently, this fund is only made up of 7 of their regular funds. -They also have an automatic investment plan for as little as $50/month. Thanks – Right as I went to sleep, I knew I forgot about TIAA-CREF. They sure do hide their LifeCycle funds though, it’s very hard to find them on their website. TCLOX (2040) actually has REIT exposure, which is interesting. It also has the least international stock exposure, at 13.6%. That’s a great observation, Blake. Is there a specific page where they have those numbers? I am curious to see what they use when they say “80% stocks”. Great post, as this was something I was looking at just today. Thanks for all the excellent information. You say you haven’t touched your portfolio in months. Do you automatically adjust your allocation somehow? Or, by not touching your portfolio, has your allocation drifted? For me, that is the advantage of the target retirement funds. I found that I’m unlikely to rebalance as frequently as I should. The TR fund takes care of all that for me. I do agree with your comment about the tax inefficiency of the TR funds. Ideally I’d like to hold my bonds in my tax-advantaged accounts and stocks in my taxable funds. I myself recommend vanguard over T. Rowe Price, but some reasons aren’t just the aggressiveness/conservative allocation, but I have a preference to index funds. That being said I have a family member who wanted to start a Roth IRA, but said they couldn’t save up 1k or 3k, so T. Rowe Price fits that bill perfectly. My family member sends in 50 bucks a month and once it reaches say 3,000 if the person isn’t happy they can move their funds to vanguard, but staying with T. Rowe Price you can’t go wrong either. I bought T Rowe Price 2040 and Vanguard 2045 since two years ago. Yes, they’re very similar. The “Find the Right Mix” chart at Vanguard lists historical return info for various stock/bond combos. Vanguard account holders have access to a similar chart under portfolio analysis –> target allocation where you can specify an exact allocation. Thanks for a great post. We currently have traditional IRAs, and will be opening Roth IRAs next month. We had been looking for another fund to set up a taxable account, and I had been leaning towards a TR fund – Vanguard and T.Rowe had been at the top of our list. This helped a lot. Samerwriter – My allocation has certainly drifted a bit. That is why I do an annual rebalancing. From what I’ve read, studies have shown that 6-month rebalancing is only slightly better, and that annual rebalancing is about the sweet spot for performance vs. hassle. I guess if you like the idea of active management, TRP would be the best way to go. They have a decent history of performance, and their expenses are on the lower side. Blake – Thanks, I think I found it. I wish they’d be explicit in what they meant by “stocks”. US Stocks? International? 50/50? This presents a peculiar problem for me, as I currently have $4000 in my account (I started it this year), however since I began it I have switched from graduate assistant income to a fellowship. Unfortunately, fellowship income isn’t considered “earned income”, so I am unable to make any more contributions (probably at least 2 years as a requirement of the fellowship is that I can not hold any form of employment). So it seems as though I will be unable to meet the minimum requirement (nor the automatic contribution requirement) for some time. Do you have any suggestions for this situation? In the worst case, I wonder if T Rowe would allow me to pay that $10 as opposed to withdrawing it from my account. Any ideas? Jake – I think you’re right. I got the $2,000 from the prospectus for TRRKX, but upon re-reading it is only for non-retirement accounts. I will fix the original post. Since your fellowship isn’t earned income, you’re not paying payroll taxes on it, right? I’d say that’s a great tradeoff for $10 🙂 I’d call up TRP about paying the $10 outside the account, I don’t know if they do that (Vanguard does). Well, I do have to pay income tax on it, just not the extra stuff. The medicare/SS tradeoff is worth $10 I suppose, unfortunately it’s more than $8000 growing tax free over 40 years that I really regret not being able to take part of. I’d pay the extra stuff for that … =) Thanks for the response. Well, the way you put it “can not hold any form of employment”, it’s pretty tough. There are lots of ways to get earned income, but I’m pretty sure they all involve employment, whether self- or otherwise 😉 If you have a spouse, you could do a contribution based on her income. Jonathan, great post!! I’m in the process of moving a traditional IRA into Vanguard, and have selected the 2045 target retirement fund. This post reinforces my decision to go with Vanguard over T. Rowe. Okay, I had intended on starting a Roth this year, but now I wonder if I can? I too am a graduate student on a fellowship, which I always considered income (we have to claim it for tax purposes), so never thought twice about how it might affect my Roth contributions. James, do you have proof somewhere to support this? I will be highly miffed if I have to put off saving for retirement *another* three years!!! A fellowship is taxable income, but in most cases it’s not considered compensation, or “earned income” (so it’s taxable income in the same sense that you have to pay taxes on dividend income). I must say that it frustrated me to no extent when I first found out that congress actually took the time to specifically disallow in the tax code graduate students from saving for retirement – especially since we’re already at a disadvantage by postponing earning real income for years, but that’s the way it works. That said, if you receive any other form of compensation (for instance, if your fellowship requires that you also hold a certain number of TA/RA hours to meet the required needs of your school expenses) this portion will count as earned income. Also, if your in a situation that would allow you to hold a side job (I know this can be almost impossible in most research related fields) where you could earn roughly $4000 in a year, that would work. I really do not know enough about self employment to advise you further, possibly Johnathan could do a brief article sometime in the future on some of the in and outs of how self-employment works. Thank you so much, this is very enlightening. I am SO disappointed though, because, I’m afraid as an engineering grad student there is NO time for outside employment and I have a fellowship that does not require TA/RA hours, so essentially my only source of income is the fellowship. Wow, I wonder if congress really knew what they were doing when they put that inclusion in there? I mean how much more of a disdvantage do we (grad students) need to be at, financially? This wouldn’t be bothering me so much if I had been on the ball and started an IRA years ago or started reading Jonathan’s blog a long time ago. Then I would merely be taking a three-year-break with prior contributions still accumulating. I am completely flabbergasted. My bubble has been burst! Vanguard Target Retirement Funds is my Roth IRA fund of choice. I almost wish 2050 is even more aggressive (a bit more international & small cap funds), but I’ll wait until I have more of a retirement kitty before I start doing asset allocation on my own. By the way, thanks for commenting on my blog. It’s like blogosphere celebrity interaction! 🙂 Your comment got caught in my spam filter but it’s showing now. Thanks very much for this conclusive analysis. I’ve been debating where to open my Roth for quite awhile now, and it’s time to just bite the bullet and go with Vanguard. Hopefully, I won’t be paying that $10 annual fee more than once. Thank you for this information. I have been googling all day to find out where to open my Roth IRA and now I am closer to making a decision. I am in the same boat as Ted Ip in that I’m torn between Vanguard and T.Rowe Price as to which target fund I want to do. What do you folks think of this idea…? I’m thinking about opening a Roth IRA at both brokerages. Half(2k) to T.Rowe Price and half(2k) at Vanguard. Most folks I’ve read have it at one place unless they have done a lot of rollovers etc. Do you folks think this would not be wise? My wife and I plan to invest in regular IRAs for 2006. 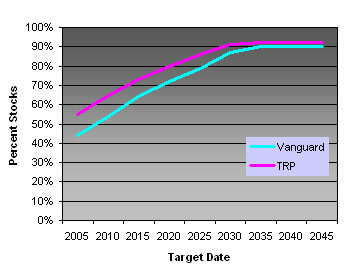 I’m inclined to invest in the Vanguard 2045 target retirement fund for our IRAs. I was wondering if its a good idea to have both our IRAs invested in the same 2045 fund or have them in separate funds. Has anyone been in this situation and if yes, what strategy did you use? I am also debating “hedging my bets” by placing 50% in Vanguard and 50% in T. Rowe. I figure I get active management exposure that way through T. Rowe as well as the index blend through Vanguard. Who says you have to pick one at the exclusion of the other? I like having the best of both worlds. I’m guessing since I’m buying through a brokerage, the maintenance fee won’t be a concern. Even if I had to pay two $10 fees, I think it would be worth it over the long haul to know I hedged a bit with two great funds. T-Rowe 2045 and Vanguard 2045 fund. I decided to roll-over my 401K into Vanguard 2045.It rocked last year!!! !It is good to hear that I made the right decision. Life funds are the way to go if you are too busy to manage your own fund.When I retire I will have time to manage my own funds. Vanguard has eliminated the $10 annual fee if you opt to recieve all materials electronically. This makes it even a better choice since the expese ratio will remain at .20% and not go up to .53%. Thanks for the thorough analysis. I opened a target retirement fund recommended as one of the Top 50 funds by Money Magazine last year (before they expanded to the Savy 70), namely, T.Rowe Price target retirement fund 2030. I have a Simple IRA with them for 2006, and now a Roth IRA and a mutal fund, all in the same target retirement fund. 2. Should I have not opened a roth IRA or mutal fund with the same target date. Please help. A young 33 year old trying to make sense of this all. I’m wondering if you also need to take the dividend yield into consideration. Right now the Vanguard 2045 yield is 1.62%, the Vanguard 2050 yield is 0.91%, and the T-Rowe 2045 fund yield is 0.96% (Source: Yahoo! Finance). Does a higher dividend impact the true overall return assuming you reinvest the dividends? Vanguard talks about their low fees, well I will never use Vanguard again and never recommend them to anyone after they nailed me for a 1% fee when I sold my Vgenx fund after I had held it for less than 365 days. In my opinion this is a rip off. Can anyone provide advice on what a respectable expense ratio is for a moderate aggressive mutul fund? I currently have a fund with Ameriprise Financial- it is a front load 5.75% fund with a .25% 12 b-1 fee and a 1.25% expense ratio. I am considering changing my investments to a no-load fund with a lower expense ratio. My current fund is performing about 9% after fees have been charged. Any advice that will help my money work better for me? i am 24 and i am in the Marine reserves. i also go to college. i came back from iraq with 35k in the bank. while in iraq i stowed 20 in 4, 5k, 12 month CDs with ING Direct (just so i wouldnt spend it all haha when i got home). i spent a bit of the rest, but i kept 5k in reserves in my ING Savings account : ). i read a bunch of financial magazines over there and the plan i came up with was to pretend i never made that soon to be 21K and invest in a Vanguard Target Retirement Account (45 or 50 not sure yet) as soon as it matures. I have one student loan for about $5500. which i dont have to pay right now. i figure it is so small i can easily pay it down instead of taking from my savings. that is the only debt i have. i figure most guys my age dont have 21K saved up, and many have huge college debt. so if they can make it with out the money i figure i can too, and just save it instead. i would like to hear what anyone thinks of my plan, and any advice on it. Joe you should consider reading the prospectus before you buy a fund. That fee is clearly stated in the prospectus, and is designed to keep expenses low for the long term investor. Thanks for the post. I opened up a a T.Rowe Target 2045 Roth IRA erlier this year without much reasearch and I am not regretting my decision and would like to go with the Vanguard account instead due to the lower expense ratio. Am I able and is it advisable to transfter my money from the T.Rowe account to a new Vanguard Roth IRA ? AJ – Sure, you can roll over to Vanguard. However, you may be charged a transfer-out or closing fee of about $50 (ask T. Rowe Price). It may or may not be worth the trouble for you. Additionally, you could just set up two Roth IRAs, which is allowable. Wonderful post, I start my first Roth mainly based on your post, though I did lots research, I still think you give the most valuable comments. vanguard increase fees to $20, which could be wavied by e-statement, I really like it! additional question, for the next year, do you think it’s better to continue put Roth IRAs money into same funds or open another one? Thank you for all your info, I am looking now to invest in a target fund and this has been very helpful. I still am not sure which one I will choose, but I now have more to think about. I am looking towards a 2015 or 2020 target fund, any ideas on these? Thank you for this informative posting! I’ve been researching T. Rowe Price v. Vanguard Retirement Funds for the past several weeks and this post is really helpful in weighing the costs and benefits of each. I currently have a couple accounts with T. Rowe Price and have been very happy with their service, but I think I’m going to go with the Vanguard Target Retirement Fund 2045 because of the lower expense ratio. Thanks again for the great info.! I am married, do my wife and I have to open a joint Roth IRA or do each of us open our own separate Roth IRAs? Also, would it be wise to have my wife at Vanguard, while I open one at TRowe to balance the risk? And if you select the 2045 funds, are you committed until 2045 or can you change without penalty? We are both 26 and plan on opening our Roth IRAs this next week, and funding both with $4000 for our 2007 contributions before April, and then put in another $4000 before next year for our 2008 contributions. I feel like we have started so late, I hope it won’t impact us too badly. I just went through this when opening a Scottrade Roth IRA. I felt like such an idiot after the guy on the phone called and said he could only transfer $4k for 2007 since that would be my individual limit. Don’t worry about starting too late. At 26 you’re fine. I just found out to my dismay that Vanguard will not open an IRA account because I am a canadian citizen, despite the fact that I’ve been a resident, tax paying, working US resident alien for the past 12 years. I was told that it’s specific to Canada. How do you make money on an INDEX fund? Is it like a stock, based on splits and the price of the shares? Or is it based off of Dividends? It just seems like funds like VTIVX just bounce up and down but barely get anywhere. I mean will VTIVX be $100/share in 40 years after a few splits or something? How does it work? I just saw this article, & I don’t know if anyone is currently reading this evaluation. I am interested in the 2030 timeframe. Just looking at the performance between VTHRX and TRRCX it looks like the TRP is the winner. Now, I haven’t figured in the expenses for the funds. Does someone who knows about financial realities have time share their insights? I would like some more guidance before I send in the check. I am also Canadian, living in the US and a resident. I just signed up for a Roth IRA using the Vanguarg website. It appears as though if you live in the US, there’s really no problem. If you don’t live in the US you’ll have to supplement your application with another form (I think it’s W8 or something). now I know which choice to make!!!! Hi, I have all our retirement savings with Vanguard. We are diversified with several stock (e.g., Health Care, Total Intl Stk Index) and bond funds (e.g., Total Bond Mkt Index, Inflation Protected Sec) and others. My question, now with all the turmoil, how safe are the Money Market funds (e.g., Treasury MM, Retirement Savings Trust). I expect risk with the other investments, but view these are very safe havens. Should I be buying gold coins instead. I have been wondering the same thing but nobody has ever been able to give me an answer. I have T.Rowe’s Target 2040 fund in a Roth, and I contribute to it every month, but the price just bounces up and down. Is this fund going to be over $50 in a couple of years of something, how am I making money? I prefer going with a smaller manager, Manning & Napier Target Funds (ex. Manning & Napier Target 2030 (MTPKX)) They have been in the life cycle business since the 80s, mainly with seperate accounts. There mutual funds were just recently released but they have collectives that have been around for a while. They utilize a bottom up approach and they don’t have 1000s of securities like TRP, Vanguard, etc – which can lead to overdiversification. just my two cents. Very informative post by the way. they pay out capital gains (maybe not this year though since not many people have gains!) but that is what brings the NAV down. Great article and analysis, Jonathan (once again). Are there any target/lifecycle ETFs out there? Or are they only available as mutual funds? Always fun to see how Vanguard and T. Rowe stack up! yOUR GRAPHS ARE WRONG ACTUALLY. THE ROTH IRA’S START AT 90 PERCENT STOCK HOLDINGS, 10 PERCENT BONDS AND BY 2045 ITS FEWR STOCKS NOT MORE. YOUR GRAPH IS JUST THE OPPOSITE ALMOST. IT MAKES NO SENSE TO HAVE 90 PERCENT STOCK IN THE YEAR 2045( YOUR RETIREMENT DATE.) GOOD ONE! How do rate having the target date funds in retirement accounts(deferred like 401k or ROTH) versus having them outside of retirement accounts. Thanks. Yeah, I agree with Jake. your % are reversed. You need high stocks % to start, lower at retirement for risk and fluctuation reduction while withdrawing. Well I went w/ vanguard 2045 mid 07 and have made a whopping -11% return. I quit investing for a while and that hurt me, but dumping in an initial 4K at almost $16 and having it go down to under $8 was painful. Hovering around $12 now. T Rowe wouldn’t have done any differently, but morningstar likes it better right now. Bad timing I guess. You guys who are young (20’s and 30’s) need to stop fretting about fluctuation in fund prices and just focus on dollar cost averaging by making consistent contributions. Let time be your friend here. have you ever checked, whether you have done better than the Vanguard Target 2045 Fund, by doing your own Asset allocation? im 55 about to roll over lump sum what do yall think of these two now? I am in between, just started a job that has Vanguard and left a job with T Rowe.This site has made me so much more comfortable about rolling my 410 k over to Vanguard.Thank you so much!!! I was very pleased with T Rowe just not the job.I was planning on getting some cash out though for a down payment on a house.Any advice on when or how I should go about it.I know there is a penalty but didnt know if I would come out better just getting what I needed then roll over or just cash out and put the rest in Vanguard.Any suggestions? Fidelity now has Freedom Index funds…that are target date funds based on ETFs (not actively managed funds), with radically lower expenses than before. You can get a Freedom Index Fund for 2045 for like .16% expenses..not bad! They just revealed these in mid-2014 I think. Take a look. I still just build my own portfolio but some may like the ease of use of these funds. Vanguard only requires $1,000 now, not $3,000, and the fee is $20, but waived with e-statements. We charge a $20 annual account service fee for each Vanguard fund with a balance of less than $10,000 in an account. This fee doesn’t apply if you sign up for account access on Vanguard.com and choose electronic delivery of statements, confirmations, and Vanguard fund reports and prospectuses. This fee also doesn’t apply to members of Flagship®, Voyager Select®, and Voyager Services®.